To be in Trinidad during the holidays is to experience the ultimate fusion of cultures. What started as a predominantly Spanish tradition has now morphed into an amalgam of influences left by the many nationalities that once governed or settled on the islands. And nowhere is it this more evident than in the food. (To my great delight.) There are over fifteen dishes that are specific to the season. The British left their sponge and fruit cakes, the Spanish left their pastelles (similar to arepas), the Africans introduced their paime (a sweetened disk of cornmeal, raisins, and coconut steamed in banana leaves), the Portuguese their garlic pork, just to name some of the more popular ones. Trinidadians take the holiday season very seriously. We even have our own version of holiday music. Like celebrating christmas itself, this music originated with the Spanish. Called parang, it began as Spanish versions of carols. Today, parang music has diverged into soca parang and chutney parang, the former referring to holiday music with a soca /calypso rhythm and while the latter is the same only with an Indian rhythm. My paternal grandfather was a traditional parandero (parang singer.) And he was good too, having been part of a parang group during his time - the sixties and seventies. When I was growing up in rural Trinidad, these groups would go from house to house in the neighborhood in the same way carolers do here in the United States. The only difference was that they were invited in for food. While Christmas is over with in the US, the Trinidadian girl in me still feels like celebrating...with food. 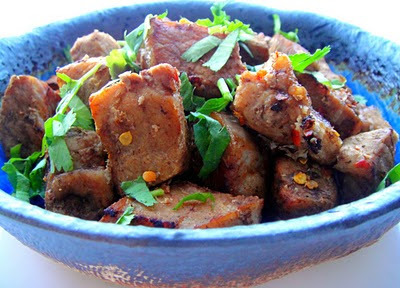 Here is my version of garlic pork. 1. Combine all of the ingredients and place in an airtight container in the refrigerator for at least two days. Maximum four days. 2. When ready to cook, remove the meat from the marinade. Add to a large stock pot with just enough water to cover, and boil until the meat is cooked through about 10 minutes. Drain. 3. Add a couple tablespoons of vegetable oil to a hot skillet and cook the pork in batches until golden brown on all sides. * Sprinkle with cilantro and serve warm with chutney or in whole wheat rolls. garlic and pork great combination! Happy and Joyful New Year 2010 for you Natasha!! Marinate for at least 2 days. I must try doing that. Must be so flavourful. Aren't we lucky to have these magnificent influences? Yes, you should try; you'll love the intense flavor. the marinate itself is already good enough to tell me how flavorful the pork is! i think i may try it with pork tenderloin! MMMMMMMM,...a lovely pork dish, Natasha! Sounds simple and delicious - my kind of recipe to feed a crowd. Happy New Year. I think this marinade will also work perfectly with your tenderloin. Good luck! Glad that this is right up your alley.